Leslie Kalomas, 55, was among the attendees milling about the exhibit hall for the Western Conservative Summit, held last Friday in Denver’s Colorado Convention Center. The annual event is publicized as the largest conservative gathering outside of Washington, D.C.
Kalomas was volunteering for the Republican party and introduced herself to me while I was staring at a selection of dolls meant to resemble fetuses at the booth for Marisol Health, a Catholic health clinic that aims to eliminate abortion from the definition of women’s health care. Sure, his comments were offensive at times, but Kalomas assured me that Trump does not actually intend to offend people. “He just doesn’t have a garden variety use of the English language,” she said. For years, Kalomas said, America had gone astray — a realization she came to 10 years ago when she suffered an accident that left her unable to work. When she applied for food stamps at Colorado’s Adams County Welfare Department, she was told she didn’t qualify because she had too much money in her bank account. (When asked about the procedure for administering food assistance, an Adams County spokesperson told me that they follow federal regulations for determining food stamp eligibility, which includes a rigorous verification process for all applicants’ citizenship and income.) When Kalomas complained to some friends who worked in the local Social Security department, they told her how they were forced to give many of the food stamps to undocumented immigrants with fake social security numbers. “It was upsetting to give people something they didn’t deserve,” she told me, and for her not to get her share. “We believe the church should work with the government,” Coleman told me. 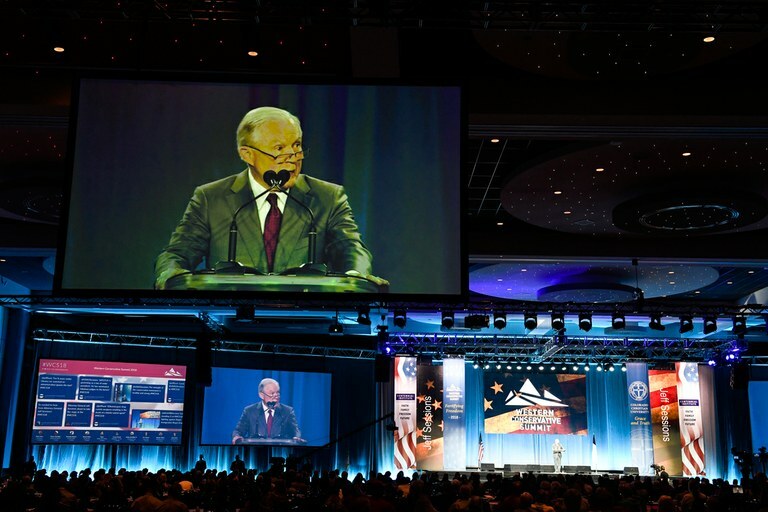 United States Attorney General Jeff Sessions speaks during the Western Conservative Summit in Denver, publicized as the largest conservative gathering outside of Washington, D.C.
Just before 2:30 p.m., the exhibit hall emptied while Lynyrd Skynyrd’s “Sweet Home Alabama” played through the loudspeakers. Then the star of Friday’s speaker line-up, Justice Department Attorney General Jeff Sessions, took the stage. Amid a standing ovation, he started off by praising his boss for governing as a “law and order president.” Under Trump’s leadership, Sessions said, the Department of Justice was reducing crime, combatting the opioid epidemic, and cracking down on illegal immigration. When Sessions mentioned the quantity of drugs seized at the border, someone in the audience yelled, “build that wall” and the attorney general endorsed the notion. Although research shows that crime rates among immigrants are lower than those by U.S. citizens, the attorney general delivered his standard rebuke of “sanctuary” jurisdictions that refuse to cooperate with Immigration and Customs Enforcement, and, from his perspective, contribute to crime, drugs and other ills. To curb such lawlessness, Sessions has instituted a “zero-tolerance policy for securing the southwest border” that aims to prosecute anyone who dares to cross the line unlawfully. “People are not going to caravan in here or otherwise stampede our border,” he said in reference to a recent group of Central American migrants who arrived at the U.S.-Mexico border in April, seeking political asylum under U.S. and international law.